Solo Board Gamers: Who Are The 1%? Given that most board games are primarily designed to be a social activity, solo board gamers at first glance seem like misplaced unicorns. On the other hand, BoardGameGeek has annual awards for solo games, its catalog takes care to tag the opportunity for solo play and solo variants, and many games do support solo gameplay. So there is clearly demand for solo gameplay. Do you play board games? Take a 5-minute survey to get your Board Game Motivation Profile and see how you compare with other board gamers. 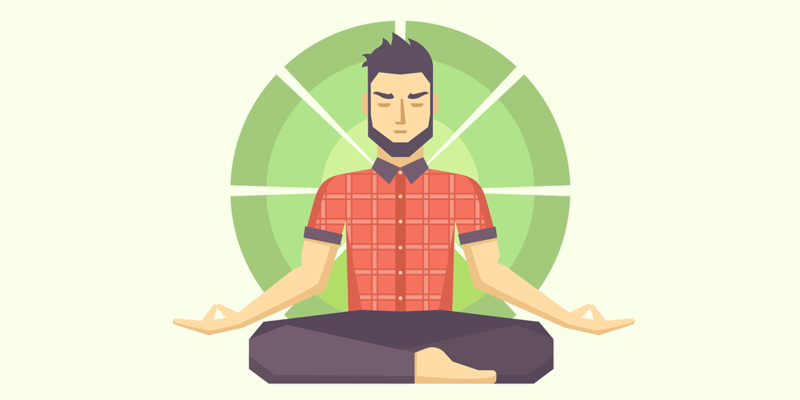 In this blog post, we’ll dive into our data from over 100,000 board gamers to explore solo board gamers, who they are, and how they are different from other board gamers. 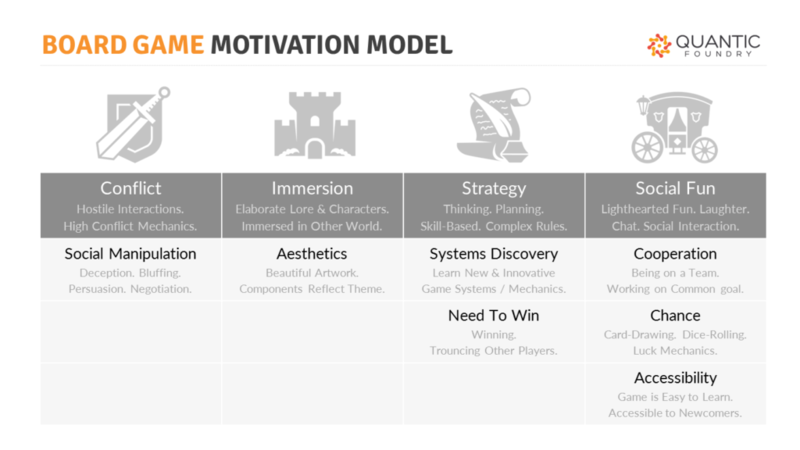 The Board Game Motivation Profile allows gamers to take a 5-minute survey to get a personalized report of their gaming motivations, and see how they compare with other board gamers. Over 100,000 board gamers have taken this survey. The 11 motivations that are measured in our model were identified via statistical analysis of how gaming motivations cluster together. What Board Gaming Motivations Are In Your Model? In the survey, we also ask gamers to indicate their preference for the number of players for a board game. This is the question we used to segment gamers for the analysis. Roughly 1% of board gamers indicated that their preference was to play board games solo. The majority of board gamers (63.5%) prefer to play board games with 3-4 players. 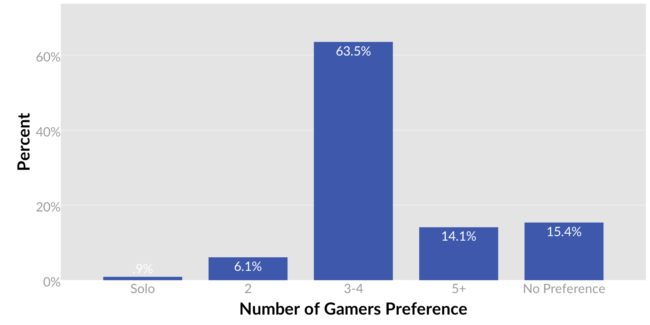 15.4% of board gamers had no preference for a specific number of gamers. This chart highlights just how unique solo board gamers are. With a prevalence of 1%, even a survey of 1,000 board gamers would yield only 10 solo board gamers—not enough for statistical analysis. Fortunately for us, we have a sample size of over 100,000. 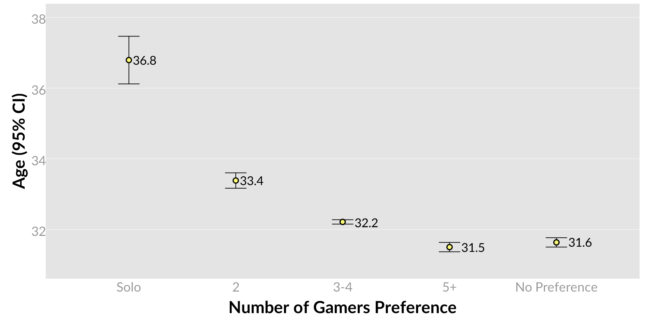 Given the large gender differences we saw in the primary motivations of board gamers, we assumed there would be some gender differences in the preference for number of gamers in board games, but the numbers are incredibly consistent between men and women. The prevalence of solo board gamers is right around 1% for both male and female gamers. And again, the majority of both men and women prefer board games with 3-4 players. Games that require more players tend to attract slightly younger gamers, and solo board gamers are much older than other gamers (about 5 years older than gamers who prefer 5+ player games). This suggests that the appeal of solo board gaming may be related to gaming motivations that vary with age. In our data, the motivations that change the most with age are (precisely) the social-oriented motivations: the appeal of Social Manipulation (bluffing, deception, and negotiation), Conflict (attacking, stealing from, or obstructing another player), and Social Fun (laughter, cheer, and silliness) all decline with age. The chart below plots game duration preference against the preference for number of gamers. If we ignore the solo bars for now, you’ll notice that gamers who prefer more players prefer longer game sessions—gamers who prefer 2 player games prefer them to run 30-60 minutes, and then gamers who prefer 3-4 player games prefer them to run 1-2 hours, etc. This makes intuitive sense; there’s a logistical cost to getting 5+ people to get together, so there would be an incentive to maximize the session time. This trend would suggest that solo gamers ought to have the strongest preference for shorter game durations, but that’s not what we found. 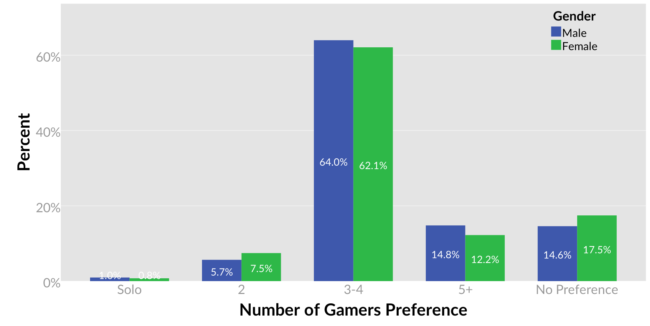 While it’s true that solo gamers are more likely to prefer <30 min game durations, their interest in most game durations is in line with the averages. In fact, their interest in >2 hour games is the second highest of all the groups. So solo gamers aren’t simply looking for quick gaming sessions; they are just as likely to want the same game session length as other gamers. Unsurprisingly, solo board gamers are most different from other board gamers in terms of their much lower interest in Social Fun and Social Manipulation. The unintuitive finding is that their strongest motivations (relative to other board gamers) are Immersion (lore, characters, immersed in another world) and Aesthetics (beautiful artwork, components that reflect theme). This means that solo board gamers are particularly interested in rich themes, world building, and game components that help make this alternate world more tangible. What Games Are Solo Board Gamers Playing? One drawback of this method is that we’re not taking into account the baseline popularity of these game titles, so some of these titles may just be generically popular across all board gamers. As an analogy, everyone buys milk at the supermarket, so it doesn’t make sense to recommend someone to buy milk. The games that appear in both lists—the ones that are both prevalent and disproportionately popular—highlight the gaming profile of solo board gamers. These are all games with a rich theme (whether horror, high fantasy, or island survival) with high production values in terms of the artwork and components. They allow a gamer to take on a believable role—typically a named character with a background story and unique set of skills—in a richly-detailed alternate world. Are You a Solo Gamer? If you’re a solo gamer, did you always prefer playing solo? Do the findings above align with your board gaming preferences? What do you look for in a board game? Did you always prefer playing solo, or was time/gamer availability a factor? Nice to see Onirim made it. Very nice game. When i did the survey myself i marked a preference for 3-4 players but most of the time i play solo or with only 1 other person. When i play solo i generally play legendary, but i also play pandemic, dungeon and elder sign, Most of these i play with multiple players as well. I was not always a solo gamer. For a long time, I quite enjoyed the idea of multiplayer games, but almost never had any opportunity to play games with anyone. When I first went to college, I finally had some exposure to more multiplayer gaming. With the exception of Dungeons and Dragons, that exposure murdered almost all interest I had in multiplayer experience. Since then, nearly every multiplayer experience in gaming (board and digital) has just made me increasingly wary of multiplayer. The predominance of reaction/aggression based gameplay has effectively forced both me, and my small circle of friends under the rug, so to speak, and the positively toxic atmosphere in many gaming “communities” is very good at keeping calmer player voices from being heard. That actually is part of why I think Quantic is such a good thing: it gives people who are either not the majority, or not aggressive enough to LOOK like the majority, at least a little bit of a voice. Thanks for sharing your experience and how it impacted your gameplay preferences! I’m curious as to why you thought Immersion and Aesthetics being the primary motivations for solo board gamers would be an unintuitive conclusion: at heart, playing a solo board game isn’t terribly different from a solo videogame; it just doesn’t require a PC and monitor/console and TV screen. The primary difference being that board games require the player to move all the cards/pieces, meaning that the reflexes that are used in most video-games aren’t applicable here, so it obviously won’t appeal to those seeking the excitement of action games compared to those who prefer more slow-paced deliberate play. That being the case, what is left for solo boardgames to offer compared to other gaming experiences except more unique worlds and roles to immerse oneself in and the aesthetics to enhance said immersion? It also explains why Chance is also a higher percentile: Strategy is often dependent on trying to predict the decisions of other players, but when there are no other players the only thing that makes one play of a given game different from another play is the Chance factor; without Chance, a solo game board game would play out the exact same time every play (unless the gamer chose to make different decisions to see a different result), so once you played it once there’s no point in playing again anymore than there is in re-reading a novel you already know the ending to. Granted this analysis doesn’t explain why people become solo board-gamers, but I think it covers why these motivations are high in these gamers. I can see why you might initially think that (I initially thought those would be highly represented among solo board gamers too but did some further thinking and realized the flaws in my initial logic) but as Strategy and Discovery are mostly is driven by the interactions of multiple actors, it makes less sense in the context of a single actor who is the sole factor responsible for driving the direction of the rest of the world of the board game. The more I thought about it, the more I realized the situation was flipped: those solo players more interested in Strategy and Discovery are more likely to play open world/RPGs than board games because in video game worlds they can substitute AI actors to play the part of opponents to test the rules of the world against without having to deal with other people and the social challenges they may present. Furthermore, these types of videogames usually have larger rule sets to test out and discover compared to their board game counterparts. I’d suggest that solo Immersion + Aesthetics players probably do play open world/RPG video games too, just that some of that base is also willing to extrapolate to board game versions that also provide that. It might also explain why this group is so small: I suggest that most players of this type do exactly what you’d expect; it’s just that some of this group might also like the worlds/roles that certain specific solo board games like those mentioned above offer enough to play said board games as well. But that number would be rather small compared to those who play board games to play with other people. If you’re willing to indulge your imagination, you can extrapolate the look and aesthetics of the board and the cards/components to the rest of the world you can see in your head. If a board game can present a specific Immersion that’s harder to find an equivalent video game version, well, just compare the board games in this article’s list compared to what the average open world/RPG offers and the motivation comparison results are a lot less mystifying. What a brilliant insight on the topic. Thank you for this article. Interesting read. I do think the numbers are a little skewed. I would answer the number of players question with 5+ because that is my preferred number. However, due to life, I am not able to game with 5+ people often and do most of my gaming solo. I have toddlers and can’t just go out and game whenever I want so I end up playing solo after the kids have gone to bed. I think you came from quite false assumption that solitaire gamers preferred numbers of players in board games is 1. I am solo gamer myself and I enjoy solitaire games enormously but my preference of players is 2. I believe that the same will be true to many wargamers out there, as there is quite hard to find local wargaming opponent who is interested in the same kind of theme/era and schedule regular meet ups for games which often takes many hours. Just in one “Solitaire wargames” group I’m in on facebook there are over 3500 members and we are speaking here strictly about wargames and those who socialize on groups as this. Nice topic, but I think questions you ask in your poll don’t allow enough flexibility in answering to really cover this subject sufficiently. While I agree with the majority of the article (the specific games I do not know about) I disagree with the 1% solitaire number. I have no factual data but I have been playing board game for close to 50 years which in itself may prove that my own assessment is incorrect. :-) IMO I would estimate between 15-20% of gamers play solo even though they would prefer to play with 2-5 players. The poll question itself was skewed in that the term “preference” was used where as if it stated “When playing board games most often how many players are there?” I believe that answer would have been much higher than 1%. Most of the games I play are 2 player games but it is difficult for me to be in a group who routinely meet to play so I play them solo. Many people play board games especially strategic war/battle simulations solo where as euro style or building games are much more difficult to play solo. I read somewhere that solo board game sales have also risen over the last 5 years though board game sales for multiple players have also risen dramatically. Definitely agree that it would have been helpful to triangulate on this with more questions/phrasings to get at folks who “regularly play solo” in addition to those who “prefer to play solo”. At the same time, I think there is an important distinction between gamers who are playing solo mainly due to time/player constraints vs. gamers who specifically prefer playing solo. And conceptually, there is something interesting/intriguing about the players who prefer board games solo. In this blog post, we focus on the latter, but we absolutely agree that there are equally interesting questions about the former that remain to be answered. To me (and maybe it’s just because I’m not a native English speaker) the phrase “solo board gamers” means people who play solo games, not players who prefer to play solo gamers over multiplayer games and the data only tells us about the latter, not the former (unless I’m misreading it). E.g. I can be a handball player, even though I prefer to play soccer. Hope I’m not overstepping here. I play quite a few solitaire games as well as multiplayer games solo. I do this not because I prefer solo play but because finding opponents seems impossible for me. Solitaire games can be enjoyable but playing against another person is preferable. But, if I have to play solitaire, then it makes sense to seek games specifically designed for that mode. I am, btw, 52 years old, male, and married. I play solo much more frequently than with other people, but that’s mostly due to time constraints and availability. I would much prefer to game with a full table. I believe it is much higher than 1%. I marked 3-4, but only as a preference with only one choice possible. I like playing games with people, but mainly solo (and enjoy it) due to necessity. feed to keep updated with forthcoming post. Thank you one million and please continue the enjoyable work.